Cylinder kit failure caused by overheat and detonation. 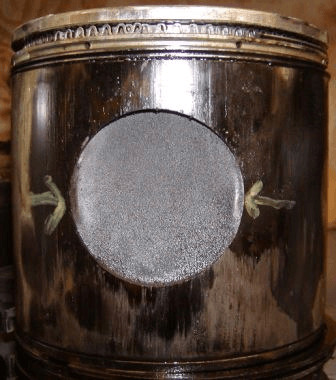 The first picture shows the scored piston and the second picture shows scoring on the inside of the liner. The final picture shows the piston crown. The red arrow points out the crack and hole in the crown and the yellow arrow points out the fuel pattern. 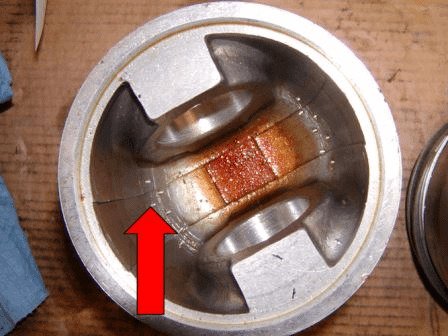 The piston and liner are severely scored from overheat. Top of piston is cracked and has a hole in it caused by detonation. 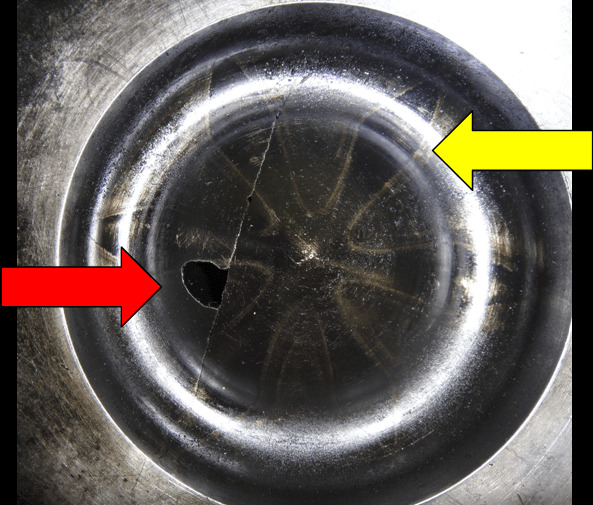 The fuel spray pattern on the piston crown is too close to the center of the bowl indicating a timing issue or a damaged fuel injector. The most likely cause of failure would be incorrect timing. 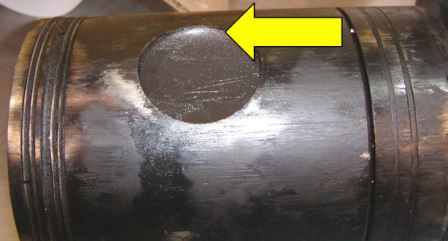 The following pictures show the bottom of the piston with the piston pin in place, note the black streaks on the pin “blue arrow” and the burnt area of the under crown “red arrow”. 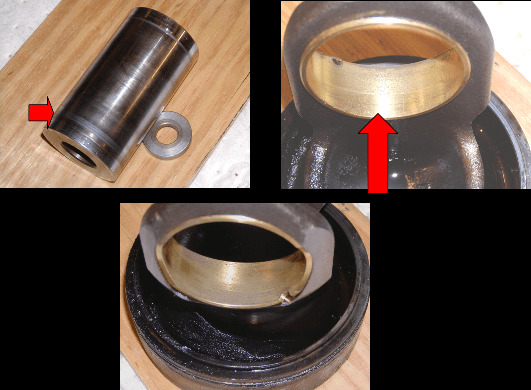 The next picture of the top of the piston shows no unusual injector pattern, indicating it did not overheat from a defective injector. 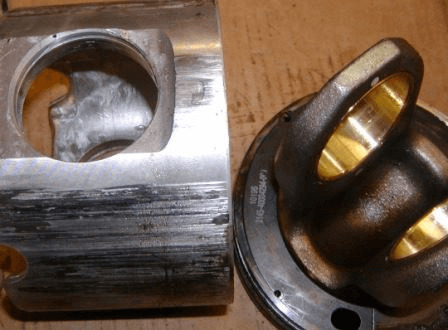 Conclusion: The connecting rod bearings for this failed cylinder kit were returned with the failed parts were in pristine condition showing normal wear. The top of the piston showed no sign of an injector problem. The piston pin showed signs of lack of proper lubrication, blue arrow. The underside of the crown was burnt, red arrows. The piston is cooled on the underside by oil from the piston cooler. The root cause of failure was severe overheat from lack of proper lubrication. The piston cooler should be checked for damage. The engine should also be checked that it contains the correct type of oil, correct amount of oil and that the oil pressure is per manufacture’s specification. Pictures of underside of piston crown show heavy deposits of burnt oil. The following pictures show the start of discoloration of piston pin and fretting in piston pin bearings from lack of sufficient lubrication. 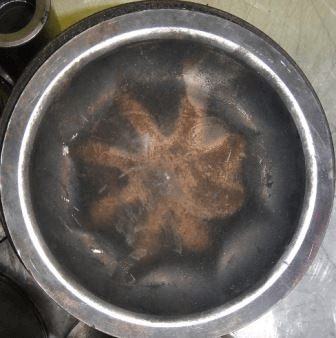 Following pictures show discoloration of piston crowns caused by extreme overheat. 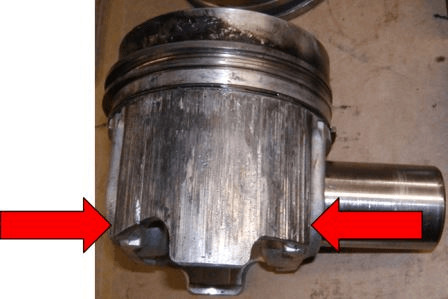 The above pictures indicate the root cause of failure to be extreme overheat of the piston crown. 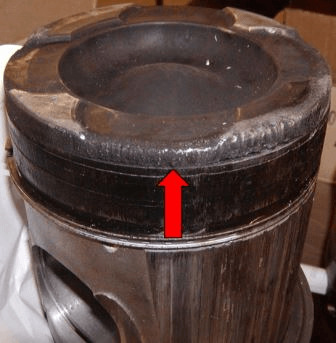 This caused the over expansion of the crown and skirt and heavy scoring of the cylinder kit. 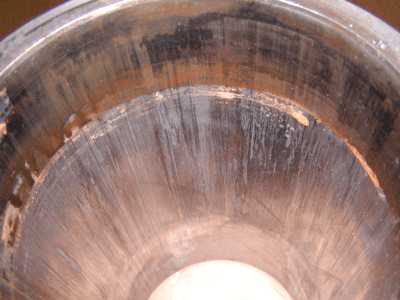 This type of single cylinder failure is usually caused by a damaged or plugged piston cooler. The first two pictures show two piston crowns that have heavy deposits of carbon; with impressions of the valves are in the carbon buildup. The next two pictures show the effects of carbon cutting and blow by on the compression rings. The pictures show the piston pin retainer bent on the edge and not fully seated in the recess. Cause of failure, leaking wrist pin retainers. Oil leaking from retainers overcame the piston rings and became an external fuel source. At the same time the oil loss reduced the flow of lubrication used in cooling the underside of the piston. 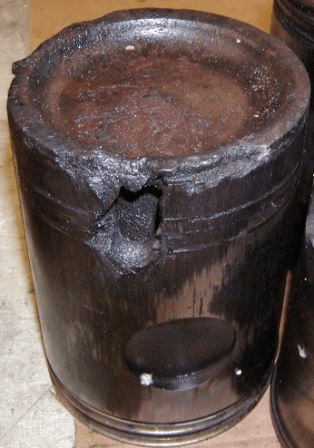 The combination of both these conditions caused the extreme overheat and excessive thermal expansion of the piston, causing the piston and liner to make contact and seize. 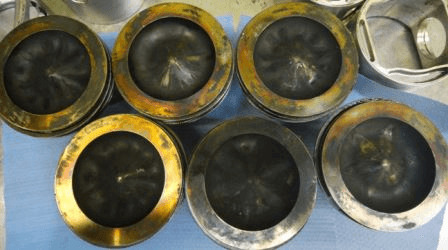 The first picture shows the top of the piston crowns discolored from excessive heat. 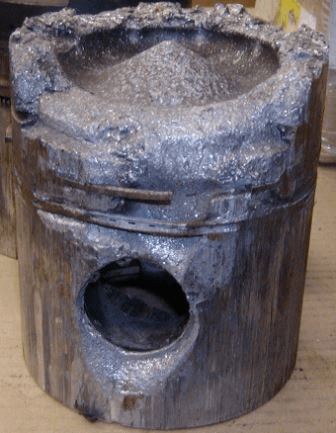 The next picture shows the underside of one of the piston crowns burnt from over heat. The tops of the piston crowns are discolored (blue) and the underside of the crowns are burnt. This is caused from severe overheat and lack of proper lubrication. The most likely cause of the failure is operating the engine with low oil pressure. The following is an example of an uneven fuel injector spray pattern. This picture shows crown edge breakdown caused by fuel injector spray outside of bowl. This is caused by a bad spray pattern or a timing error. This piston failed due to a bad injector tip spraying fuel out of the combustion bowl and between crown and liner creating a hot spot that burned through the piston. 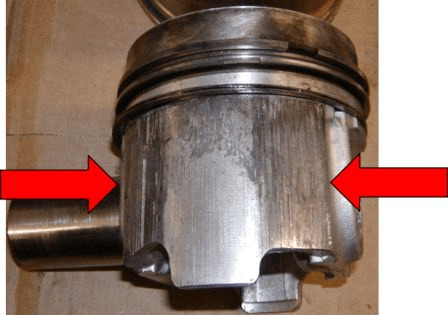 Piston below shows edge nibbling from a faulty injector spray pattern. Final example of fuel caused failure. The following pictures show the piston crown burnt on underside and blue in color from severe overheat. The cylinder kit failed due to overheat. A spray pattern could not be detected on the crown. 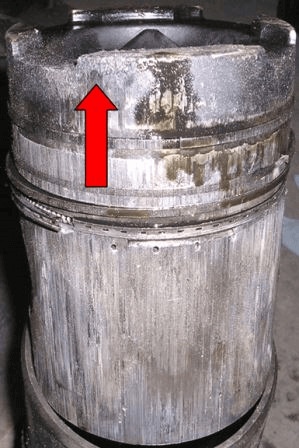 The piston pin and bearing appear to have normal wear however the underside of the crown is burnt and the piston began to turn blue. This by itself would indicate low oil pressure. Another area that could cause overheat would be a timing issue. 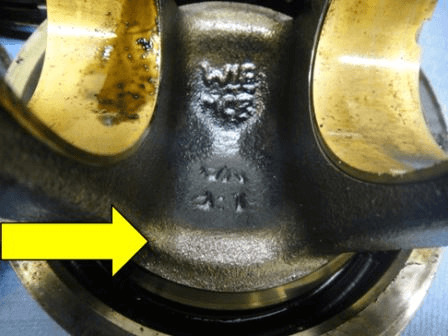 Valve marks on the crown of the piston indicate the root cause of this failure, incorrect timing. 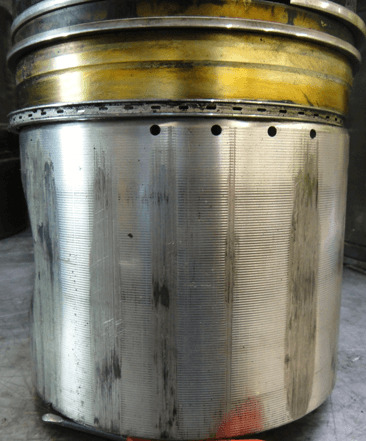 The next pictures show the piston skirt and liner scored from abnormal expansion. The final pictures will show valve contact marks on the crown of the piston. The following pictures show quarter point scuffing. Pattern of fuel injector on top of piston appeared normal. The underside of the piston was clean with no burnt oil indicating that lack of lubrication was not the root cause. The most likely cause of failure points to the cooling system and the possibility of air entrainment. 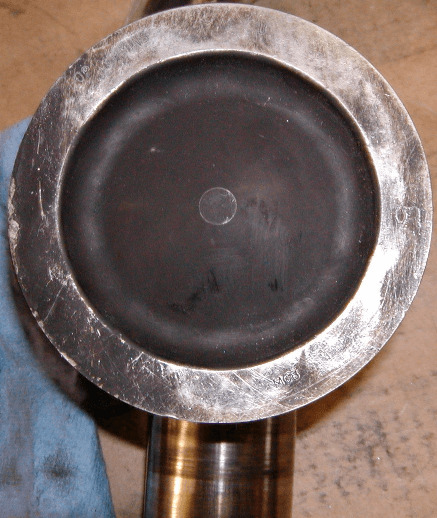 Natural gas application - The picture shows discoloration of piston crown caused by excessive combustion chamber temperatures. 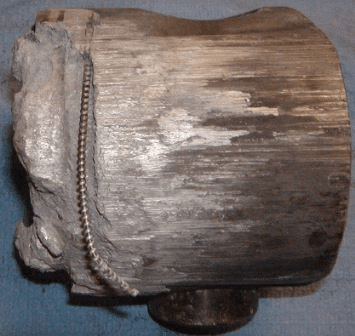 In a natural gas application, this type of failure is normally the result of improper engine timing or incorrect fuel mixture. 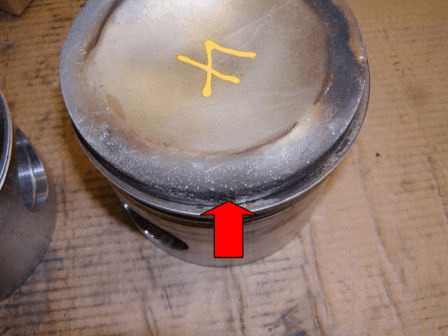 The picture below shows the piston crowns starting to melt from overheat.